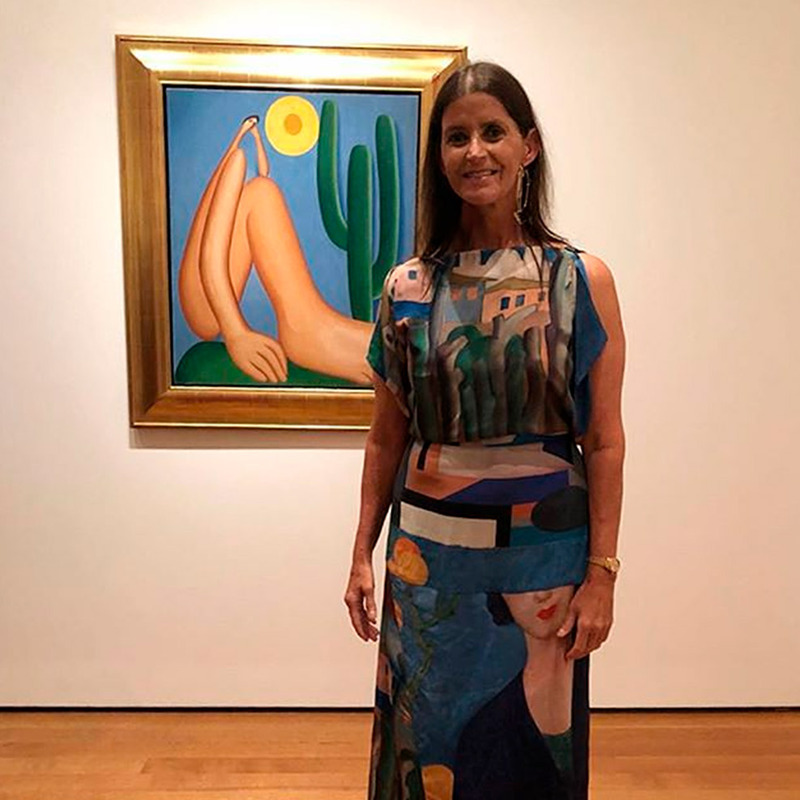 The exhibition “Tarsila do Amaral: Inventing Modern Art in Brazil” is on show at the Museum of Modern Art (MoMA) in New York City after a four-month run at the Art Institute Chicago. 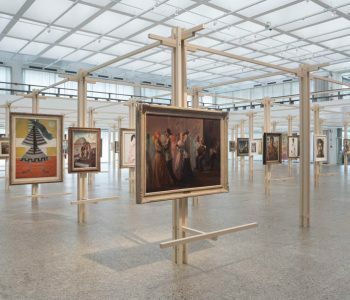 Amid the 120 works are the most iconic paintings of the artist who is part of the Brazilian lexicon and hailed as one of the country’s national treasures. 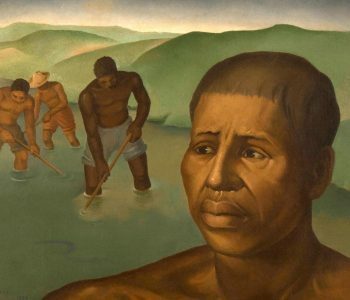 They are the “Abaporu” (painted in 1928, it sold in 1995 for 1.5 million dollars to Argentinean collector Eduardo Constantini), “A Negra” (1923), “Antropofagia” (1929) and “Operários” (Workmen, 1933). 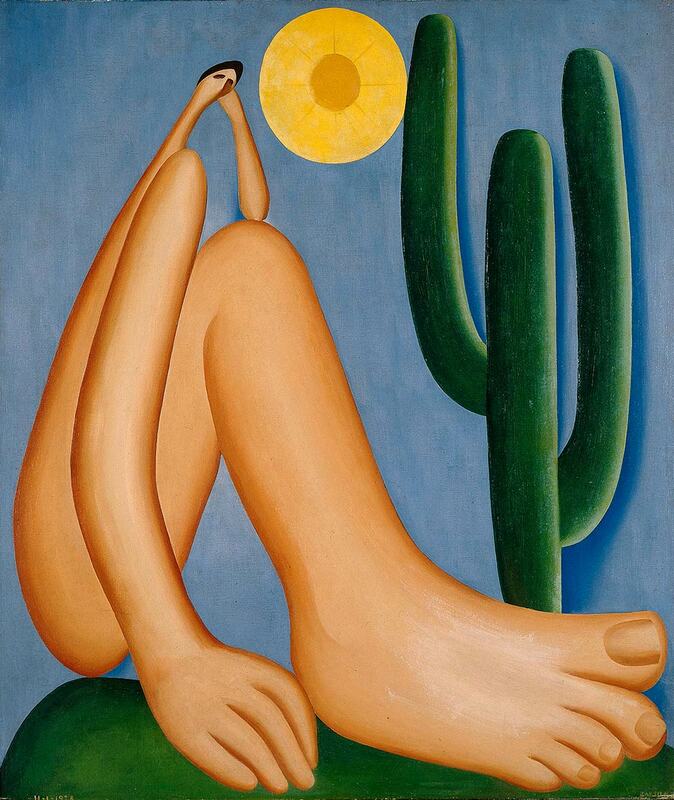 In the 1920s, the peculiar artistry and extravagant lifestyle of Tarsila do Amaral (1886-1973) were misunderstood in her own country because she was a woman and far too beautiful, too talented, too rich and way too modern for a Latin macho society to take in. She was even rejected by members of her own family. The first phase of Tarsila’s work, known as Pau-Brasil (Brazilian Wood), is a far cry from the conservatism advocated by the Beaux Arts she learned as a student before moving to Paris in 1920. It begins in 1923 with the iconic tableau “A Negra” (The Negress), the pioneering work that marks the beginning of Brazilian art free from European diktats. Dubbed by art critic Sergio Milliet as native primitivism, it exalts Brazilian themes with its flora and fauna summarized in a few exuberant elements as well as urban progress promoted by machines in contrast with the country’s exotic tropical beauty. The second phase inaugurates the Anthropophagy movement in Brazilian modernism. The concept was idealized by her lover and future husband Oswald de Andrade and relates to cannibalism perceived as a metaphor for the appropriation of otherness. In this phase, she paints the iconic disproportional figure with a gigantic body topped by a Lilliputian head, “Abaporu” (1928), in bold, vivid colors that nods to the chromaticity of the Brazilian flag. “Abaporu” is a poetic fusion of two Tupi-Guarani (Brazilian Indian) words meaning “man who eats human flesh,” created at the spur of the moment by Oswald and poet Raul Bopp upon gazing at the painting for the first time. The idea behind Anthropophagy implies Brazilian artists, writers and poets should “digest” European knowhow to develop works with authentic Brazilian statements. Her work that best symbolizes the movement is “Urutu” (Urutu Viper, 1928), also known as “The Egg,” a snake with its power to swallow encircling an egg, the genesis, symbol of birth and the new. Her third phase, the Social period, coincides with The Great Crash of 1929 and focuses on the conditions of Brazil’s workers and its poor. The painter is faced with a harsh reality—her father loses all his wealth—and suffers an additional traumatic blow the next year when Oswald flees with her with her best friend Pagu, the pen name of a beautiful talented avant-garde writer twenty-four years her junior. Confronted with an irreversible reality, Tarsila is obliged to sell most of her paintings and embraces a communist ideology as seen in the first socio-political painting of Brazilian modernism, “Operários” (Workmen, 1933), to date the most exhibited of all her paintings. Tarsila continues as a painter until her death in 1973 at age eighty-six. However, her revolutionary narrative that emerged in the 1920s lost its visceral vigor after the mid-1930s. 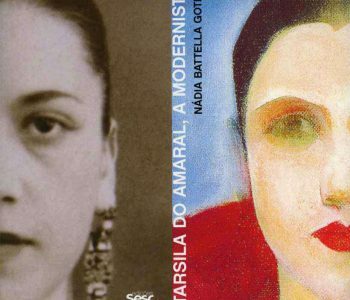 We interviewed her grandniece, equestrian riding instructor Tarsilinha do Amaral, who has been for more than twenty years the family representative to the copyrights of artist Tarsila do Amaral and author of several books on her grand aunt, Brazil’s grand dame of modern art. 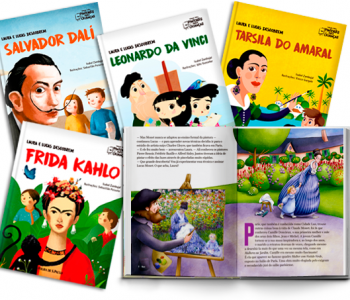 Tarsilinha, what is your opinion of this exhibition? It is a milestone for Tarsila’s oeuvre. It took us seven years to accomplish all the organization process to its official opening in the Art Institute Chicago from October through January of the last year following the second iteration at the MoMA in NYC through June. Tarsila is now on the way to become a staple international name in the history of visual arts of the first half of the twentieth century where she rightfully deserves to be. What is the last thing you remember about your great aunt? I remember her as an old lady in a wheelchair stylishly dressed. Tarsila was always very vain, very concerned with her looks. It was a privilege to visit her apartment with my parents and see her iconic paintings hanging on the wall. On her deathbed in 1973, she gave away one painting to each of her nephews and nieces, including those who had never sided with her. She told my father [a lawyer who had managed his aunt’s copyrights since 1956]: ”Guilherme, keep this one, it will be worth a lot of money, it may help you in the future.” She was aware of her importance and was sure her recognition would come after her death. You mentioned she was very concerned with her looks. In her youth Tarsila was known as one of the great beauties of her time. She was the whole package: beautiful, talented, wealthy and modern. Tell us about the exciting life she led in Paris with her intellectual beau Oswald de Andrade in the 1920s. Woody Allen missed out Tarsila in “Midnight in Paris”; that was her crowd. In Paris, she was known for her exotic beauty, for her talent as an avant-garde painter and for her parties. On Saturdays her studio was an open house with typical Brazilian cuisine and caipirinhas for her friends Cocteau, Satie, Jules Romains, Giradoux, John dos Passos, Brancusi, Vollard, Blaise Cendrars, Léger, Marie Laurencin, Sonia and Robert Delaunay…. 1926 was an important year for her. 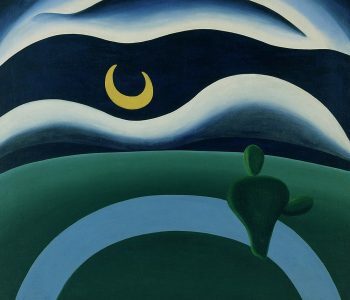 It was the year Oswald and Tarsila traveled to the Middle East, visiting Greece, Turkey, Lebanon, Cyprus, Israel, Egypt… To her mother she wrote there had been “lots of dust, luxury hotels and tuxedoes but all beautiful.” In Paris in June that year, her first solo show happened at Galerie Percier, known for exhibiting Picasso, Léger, Mirò, Modigliani and Uruguayan artist Torres-Garcia. The French critics were very generous with the reviews. When did her first solo happen in Brazil? Only three years later in Rio, then the country’s capital, at the gallery of the Palace Hotel [today’s Copacabana Palace Hotel] but it had negative reviews in the local press. She commissioned the sophisticated frames to art deco designer Pierre Legrain; “A Cuca” (The Critter), that belongs to the Musée de Grenoble Collection, in France, is among the only ones left with an original frame. The show was too avant-garde for the provincial mind Brazilians had then. 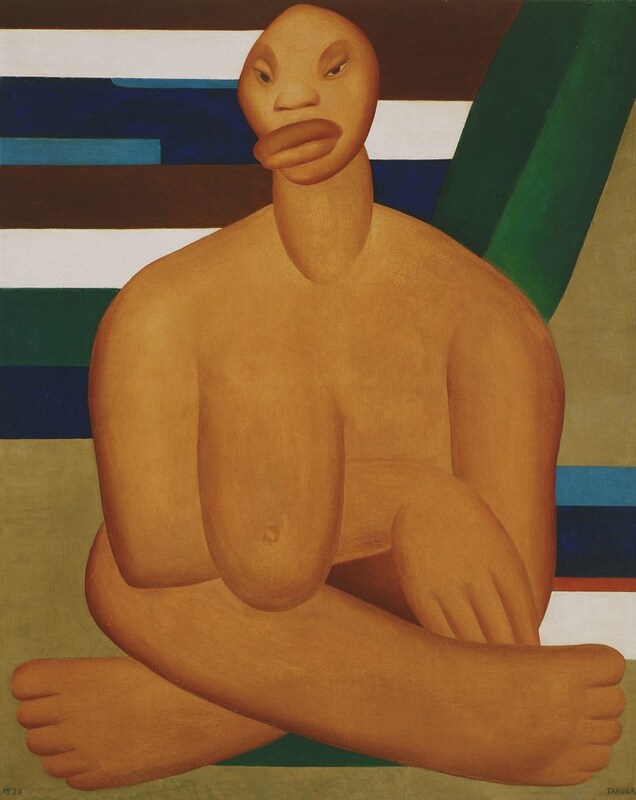 Now tell us about her most iconic painting, “Abaporu”(1928). Tarsila was instrumental in the formation of the Cannibal or Anthropophagy Movement (1928-1929). In truth, what ignited Oswald to write his revolutionary “Cannibal Manifesto”(1929) was her canvas “Abaporu,” painted in her studio in São Paulo and the last painting she gave him before they broke up. Art critic Sergio Milliet remarked it was the first time a literary movement flourished from the visual arts. What took Tarsila to Paris in the first place? Before her first move to Paris in 1920, Tarsila had studied art with the best teachers in São Paulo. She was a quick learner, her tableaux of this period are classic and very neatly executed, a quality she perpetuated in all her later phases; her brush strokes are done with utmost perfection. After her first trip to Europe at age sixteen, she was enrolled in a Catholic school in Barcelona, where she was taught to paint religious portraits—Tarsila was very devoted all her life. When she comes back to São Paulo, she gets married but soon leaves her husband under the disapproval of local petty society. To get away from it all, she moves to Paris in 1920 for a two-year stay. She enrolls at the famous Académie Julien to dedicate full time to enhance her artistry and visits museums to learn from the old masters. She becomes a fully modern woman in Paris backed by an adoring father who satisfied her every whim. How about the influence Oswald de Andrade had on her? As soon as she comes back to São Paulo in 1922 and meets Oswald de Andrade they fall madly in love. He was the most influential and controversial figure of Brazilian intelligentsia of the 1920s and a ladies man. He was a charismatic, tall man impeccably donned, always a cigar in hand, with a big voice, sharp words and large smile. Oswald was instrumental in opening Tarsila’s mind and introducing her to a bohemian, intellectual lifestyle, which she didn’t know till then but eagerly embraced to follow her lover. When they met, she was but a skilled painter in need for the magic push provided by Oswald to free her artistic voice. The eight years (1922-1930) spent together back and forth between São Paulo and Paris was a “moveable feast” to put it in Hemingway’s terms. They were a couple all over town, they were charming, well dressed—she wore Poiret and Patou—fun, cultivated, exotic, plus she was a beautiful heiress with tons of money to spend from her family’s thriving coffee business. Coincidentally, the 1920s was also the most remarkable period in her career.